Portable Shipping Racks (Collapsing) | EGA Products, Inc.
EGA Products is a proud manufacturer of returnable collapsing shipping racks for Tier One suppliers to the automotive, manufacturing, metalworking, military/government, plastics, shipping, steel, textiles, pulp/paper, and energy industries. No matter the industry or product, EGA has a shipping rack that meets your manufacturing, storage, logistical, or transportation needs. Contact us or Request a Quote to learn how your business will benefit from using shipping racks manufactured by EGA Products. Why choose EGA custom shipping racks? Our collapsible shipping racks are custom-designed by expert engineers and manufacturers to cater to the storage and transportation requirements of any component crucial to the manufacturing/plant production process. Boasting the storage capacity to hold everything from mufflers, to catalytic converters, to suspension pieces, to glass windshields big and small, to just about everything in between and outside the box, EGA Products custom shipping racks are designed with the simple goal of proactively saving you time and money by increasing convenience and workflow efficiency. Once the returnable shipping rack is emptied, our design allows for an automatic fold down for economical return shipping. This controlled collapse makes it fast and easy to remove from your workspace, opening the floor for your next parts to come through on the next collapsible shipping rack. The effects of this system are multi-pronged. Transporting parts is easier. Your assembly line/workflow increases its output. Problems in your workflow drastically decrease. Comprehensively, shipping racks designed and built by EGA Products help you meet customer demands, while keeping you under budget and over-productive. Collapsible shipping racks can accommodate multiple dunnage systems. Typical industrial applications: automotive, manufactured goods, metalworking, military/government, plastics, shipping, steel, textiles, pulp/paper, energy. Rely on EGA precision engineering and manufacturing expertise to design and build custom racks like these, and other equipment that will meet the specific people-access, materials-handling, or storage needs of your industry and its processes—no matter how simple or complex your requirements. Or learn more about our other Custom Designed & Manufactured Products. I have had the pleasure of working with EGA Products for more than 30 years. It’s been a great relationship! 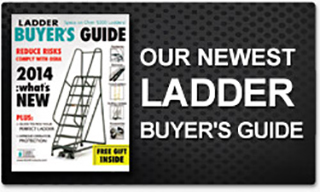 EGA’s ladders are tops in the market place with regard to quality and breadth of line. EGA’s ability to do custom work in low, as well as high volume is invaluable to me - in my efforts to be a value-added supplier to my customer base. EGA’s inside team of Scott, Tom and Pete are responsive to our requests and work hard to meet our needs.